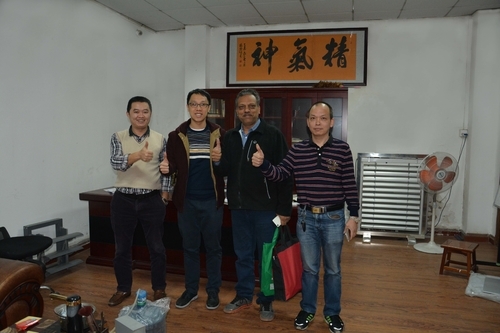 Our customer from Pakistan to visit our factory in October 17th. Pakistan , officially the Islamic Republic of Pakistan, is a federal parliamentary republic in South Asia on crossroads of Central Asia and Western Asia. It is the 36th largest country in the world in terms of area with an area covering 881,913 square kilometres (340,509 square miles). Pakistan has a 1,046-kilometre-long (650-mile) coastline along the Arabian Sea and the Gulf of Oman in the south and is bordered by India to the east, Afghanistan to the west, Iran to the southwest and China in the far northeast respectively. It is separated from Tajikistan by Afghanistan's narrow Wakhan Corridor in the north, and also shares a maritime borderwith Oman. Our salesman Simon briefed the customer Alex to introduce the basic situation and the export capacity of our company in the meeting room,and then led Alex to visit our production workshop, warehouse,QC workshop,etc..Alex was intrested in Aluminium Sun Shades Series,so that Simon on the products were introduced and explained in detial.